At Business and Industry Today we are pleased to recognise companies that are committed to upholding industry excellence. This is why we are thrilled to present Steps and Stillages with our prestigious Material Handling Company of the Month Award. This has been awarded to the company for their commitment to outstanding customer service in addition to their exceptional manufacturing services. 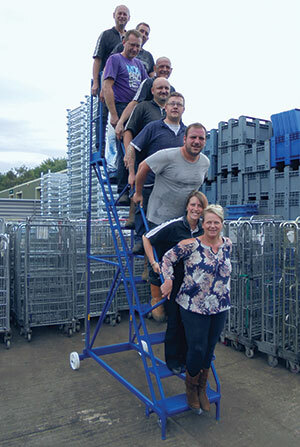 The company are proud to design, develop and manufacture a range of stillages, roll cages, roll pallets, trolleys, containers, garment rails and safety steps. In addition to this, the company also manufacture a selection of other equipment for varied applications across the manufacturing, horticultural, warehouse, industrial, retail and distribution industries. The company are currently based in Kettering and have made it their mission to offer clients a first rate product at a low price, producing a large range of bespoke products if and when required. With over 40 years’ experience in the industry, the company work hard to produce the best stillages and trolleys on the market. They currently have 4, top of the range, robot welding lines that produce large volume orders at competitive prices. In addition to this, the company also stock a large amount of standard products which are available today and despatched immediately. Similarly, they also stock a large amount of second hand roll cages and stillages which are incredibly cost effective, and are thoroughly checked before they are dispatched. It is important to note that the company have recently increased their range of plastic pallet boxes. They have over 600 standard pallet boxes in 3 colour choices in standard pallet size (1000mm x 1200mm); however, they also stock smaller quantities of different sizes for customers who require a tailored range. Graham also told us about the company’s two new business divisions, Gas Cages and Spill Control. The company’s Gas Cage division will specialise in gas cylinder storage cages and cylinder handling, whereas the spill control division will offer clients a one stop shop for spill control and spill containment products. This will include budget price sump pallets and additional high quality versions, with a range of absorbents to clean up any spills. If you would like to get in touch with Steps & Stillages, contact them on the number below. Alternatively, if you would like any more information on the company’s products and services, make sure you check out their website. This entry was posted in Company of the Month, Featured and tagged Material Handling. Bookmark the permalink.